This is the perfect appetizer. The flavors are amazing! I saw this recipe flipping though an old Food Network Magazine and was intrigued. I knew it was something I had to try. 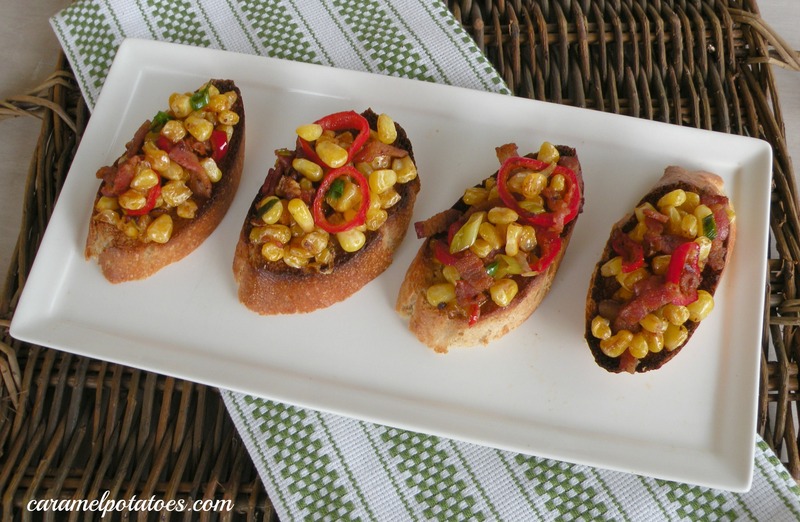 How could it go wrong with bacon, corn, and garlic on top of toasted bread. I am so glad that I gave this recipe a try. I couldn’t stop eating it. Fresno Chili Peppers were new to me, but they are widely available it seems. So if you are unfamiliar with them, they are a small red pepper in the produce section next to the jalapeno peppers and such. They do pack a punch, but there isn’t much of them called for so the spice is not overpowering any of the other flavors. In a large skillet over med-high heat, cook bacon until crispy. Remove bacon from skillet and set aside. Pour excess bacon grease from pan and add corn. Cook corn 3-5 minutes or until starting to brown. Add the chiles and cook an additional 2-3 minutes. Add the bacon, a little salt and the vinegar. Stir to combine. Toss in the green onions and remove from heat. Turn on the broiler and lightly coat one side of each slice of bread and place oil side up on a baking tray. Broil 3-4 minutes or until toasted and brown. Rub the toasted bread with the garlic halves. Top with the corn mixture and serve! *Recipe adapted from Food Network Magazine Aug/Sept 2009. This looks delicious! I’m going to try it with fresh sweet corn, now that it’s in season. Thanks!